Plymothian Transit: First For the Fight? Assuming that First are staying around, what new routes, if any, do you expect First to introduce in 2014? Ernesettle and Whitleigh to the Centre via Mutley, Eggbuckland to the Centre, Southway to the Centre, Plympton & Chaddlewood to the Centre. They are rumors that they are going to do the routes out to earnysettle, plympton and maybe Whitley again but more competitive. A major attack on main corridor services to Plympton, Whitleigh, Southway and Ernesettle. As expected, Plympton, Whitleigh/Southway Ernesettle are the main contenders. They have been there before so they know the way! Reinstating variations to the Tavistock routes. Some changes to the Plymstock network. I expect First to consolidate to start with following the success of the 6 and 3a. Both of probably more successful in terms of turnover etc than Citybuses 12/32, and in terms of the 6 is picking up more than Citybus 8/9 on most journeys even after Citybus fare cuts. If however Citybus have not learnt from this and choose to expand further into First territory I expect First to retaliate with routes to Plympton and Southway later in the year. A few suggest First would be better off concentrating on their existing routes to retain the passengers they already have. A few suggesting they are constrained by existing resources so would pull off one route to boost another. First might try new services or branding such as UGObus to compete with Plymouth city bus, but most likely will end up cutting services and sending better vehicles to other parts of the First empire! just to re jig services in line with responses to City Bus competition but I don't think the purple 6 has worked that well. I think first will keep their Torpoint running's and Tavistock and that those will be their main focus with city services heavily reduced/cut back to almost nothing. I think First will have a go at a number of Citybus routes like they are doing in Ipswich but just being a hindrance! Just look at the difference in North Devon and Wigan now First have departed and Stagecoach has taken over! As with the last competition with Citybus, I think they will retreat to the network they had before the current adventures started. They must have a minimum number of vehicles to keep busy in order to be able to spread their overheads. I'd imagine they'll try a few new routes but it may well be futile, I'm afraid. How long can they retain a £1 fare? Not past March, I would guess. Public Transport Experience: Quite how he could have a secret lair in a non-existent property was not fully explained! British Bus Bugle: Let's take a look at how well Blackpool Council informs residents and visitors alike about public transport in its area. Focus Transport British racing champion Button owned the bus or eight years from 2003 until 2011 - and toured in it around the world during his title-winning season in 2009. Public Transport Experience What IS a Streetlite Hybrid? Well, it isn't a "hybrid" Hybrid! I hope First do consider Southway/Whitleigh, we could do with a cheap and reliable service here, not like what we currently have. I believe First staff had meeting with Alex Carter this week re future plans, anyone out there know how this went ? 2 that stage coach may be moveing in and took over all first route,s ,and give go ahead bus wars . What a coincidence...I had a chat with the paperboy his morning. He gave me a quick briefing of the current position in News International's management accounts for the year to date, told me how many lorries and vans they were buying this year and what their plans for wider investment were. He wasn't very complimentary about Rupert Murdoch though...apparently he doesn't spend enough time in the office. Two things a driver told me...1 2 3. Lol! Re the training bus, any company will need to recruit staff unless they have nil turnover of drivers. No bus company I have ever come across has that happy situation. It is also the case if a company's work is contracting, but can't keep pace with staff turnover. First have converted 68571 into a traning bus. Noticed that First have made a move next door in Taunton dated Sunday 26th Jan 14. Out has gone "First" (almost completely apart from legals) and in has come Buses of Somerset (.co.uk) and Buses of Taunton. They are using a two tone green swooped livery on the new timetable books, bus station paint work and the two buses so far repainted. The web site went live around lunchtime today. The fare structure is new and the First south west day ticket for £7.50 is replaced by a cap on returns at £7.50 and a £10 day ticket just for their routes. anon 1st feb - sounds like cuffy again! u can tell by the bad spelling! I think this is rubbish. First are NOT about to pull out of Plymouth, this is just scaremongering, a continuation of the rumour that has bn going around for years. Stagecoach I do not think would be interested in it;s current form however First are turning a corner and it is interesting how quick First were to retreat from the X80 when Stagecoach registered their gold route. Why did Stagecoach put so much on a route that 1) does no really make a profit and 2) They failed miserably on before? Funny First seem well up for the fight with Go Ahead in comparison though! I expect Stagecoach to extend the Gold service further for the summer with a Dartmouth - Plymouth service and First to withdraw the 93, using the resources on another new Plymouth route in retaliation to citybus starting on the Mountbatten corridor. Where First do go they will be much cheaper than Citybus and will also reduce fares on Mountbatten corridor...forcing Citybus to reduce fares and Citybus into a loss! I cannot see the logic in such a comment. Both Citybus and First will have the same overheads to contend with (wages, engineering, fuel, insurance, etc). If Citybus will be losing money with these reduced fares, then surely so will First. In terms of their Plymouth operations First’s fares on some corridors are very low – artificially low? Just because a bus is full doesn’t mean it will be making a profit. It doesn’t matter how many passengers you carry if the fares are too low. Some commenters seem to see busier First buses (although how representative are these observations?) and assume First is winning. With such low fares I can’t see it being a case of who’s winning, but rather be about who is losing the least. It should perhaps be remembered that First have less routes to spread losses between. Citybus may have a little more slack in this respect – a case of who will blink First? I’ve seen many comments about how Citybus will have red faces and they have the added pressure of funding all these new Enviro 400s. However that suggests a slight naivety about how new purchases are costed. The new vehicles will be replacing the oldest vehicles in the fleet (not necessarily directly, but through cascades). This is something that would be required whether there is competition or not. If your oldest assets are life expired they need replacing. To not do so on a rolling basis simply leaves you with a ticking bomb. The asset value of these old buses will have been depreciated over their lifespan and the same expectation will be given to the new buses. In any event the cost of a bus over its lifespan is only a very small part of the cost of operating a service. Yes, First and Citybus have similar overheads but Citybus have a much larger, profitable operation to spread them over. Figures have already been posted on this blog showing how First's £1 fares simply can't be making them money. The point which many people don't seem to be able to (or want to?) grasp is that none of this is about a bus war. It's not about winning or losing. Citybus will be around regardless - they have a large operation that makes money and is able to make investment in their fleet for the long term. They have a clear vision, strong, rejuvenated brand and scope to not have to worry if one or two of their new ideas and initiatives don't work out. No, the only relevant point is that First has to convert a loss into a profit before Head Office (and the shareholders) finally say 'enough is enough' and to do this they have to find sufficient work to keep busy whatever their minimum fleet size is deemed to be, otherwise their fixed overheads will just make any other profitable routes unviable (irrespective of what Citybus might be doing). Hence the rejigging of routes and the cancellation / commencement of others. If they can't find sufficient work to employ those vehicles (and preferably more) it will be game over. Let's not forget either that because Tim O'Toole basically stood up and made the 'near close-down' comment, First will now be making less profit from their key Torpoint and Tavistock routes because some of that revenue is now going into Citybus's pocket. You can't blame Citybus for moving in when they were near enough invited onto the routes by the CEO! Anon @2027 - it's a fact that First were going to sell last year, but the deal fell through at the 11th hour. With their massive losses First are hardly in a position to seriously challenge Go-Ahead in Plymouth. My hunch is that the outlook in Cornwall is potentially much healthier. 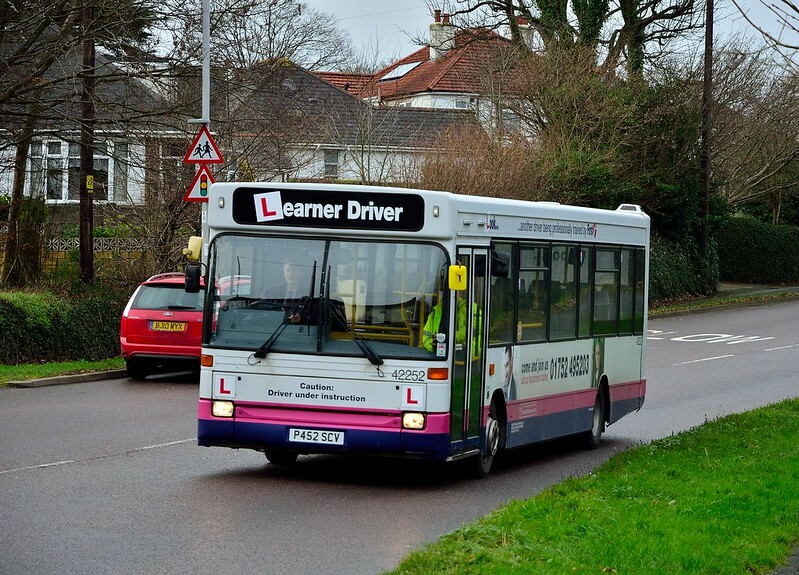 Cornwall Council are tendering the entire supported network on 4-5 year contracts, with some of the routes cuts in November being restored,and reinstatement of Sunday evening services on some routes. There are clearly rich pickings here if First can pick up work from Western Greyhound. Four/Five year tenders sound great from a planning/stability of income basis but it may not exactly turn out that way. Lets not forget in recent times there have been two significant occasions when Cornwall Council have said sorry can not afford the current level of subsidy & everything had to be reviewed - the first back in 2011 led to the current 2 year tenders just about to expire,then September 2013 another 1 million shortfall resulting in significant cuts.